We may have just witnessed one of the most vicious and blatantly dirty acts ever committed in college basketball. 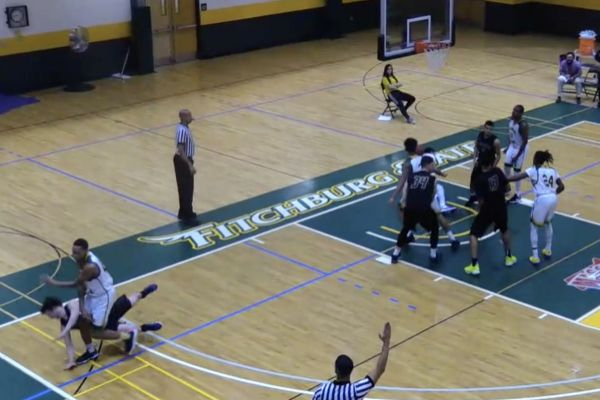 The player, Kewan Platt of Fitchburg State, was caught on video elbowing sophomore guard Nate Tenaglia, who’d just attempted a 3-point shot from the corner. Prior to his cheap shot, Platt air-balled a three at the other end of the floor and was upset that he didn’t get a call. Tenaglia then hit his three right before taking the hit. Platt headed towards Tenaglia and elbowed him in the face all the while making sure the referee wasn’t looking. Platt was ejected for his hit and not only was he suspended indefinitely he was also barred from campus. Tenaglia appeared to be OK after the shot, making both of his free throws. Nichols went on to win the Division III matchup 84-75.